Creeping Fig (Ficus pumila): growing, planting, caring. A sweet and loving houseplant ! A member of the fig family, the Ficus pumila is a fast-growing, climbing vine. It doesn’t require full sun or a lot of water, making it a simple plant to grow, withstands colder temperatures than many other ficus and won't necessarily drop its leaves at the first whisper of a cold or dry draft. Your creeping fig prefers warm and dry environments - it does particularly well in the comfort of our houses and apartments. It needs light, but not direct sunlight, and it hates drafts and temperature changes. It doesn't handle being moved around well! Avoid planters with water reservoirs — ficus roots can't handle constant submersion. As soon as the soil is dry to a depth of one or two centimeters, water your creeping fig, ensuring you moisten all of the topsoil. During growth seasons (spring, summer), watering should be regular, about once a week, but controlled, to make sure the roots don't drown. In autumn, gradually reduce watering until winter, when once-monthly watering will suffice. In dry weather, spray your ficus with soft water, clean the dust on the leaves: it will be all the more beautiful and you will protect it from red spiders - its main enemy! Simple pruning will give your ficus the perfect pick-me-up! At the beginning of spring, when you can smell the first growth of vegetation, arm yourself with a good pair of pruners, shears, gloves and — pro tip! — with a tarp or an old sheet. This will help protect the soil, since ficus produce a sticky, white sap (latex), while also making collecting and disposing of the trimmed branches a breeze! Latex is a good thing — it protects wounds in the tree from diseases! You can do a quick spring trim by cutting back most of the branches about 10 cm to encourage growth, or more radically by completely getting rid of any bare or dry branches. Your ficus will appreciate it and come back looking even more beautiful! Every three or four years, at the end of winter, repot your ficus! You can also repot your ficus when you purchase it, especially if the pot falls or tips too easily. That's a sign your ficus cramped for room! Choose a large clay pot, approximately 5cm larger than the original. Thoroughly spray down the original pot and place any leftover stones, clay pellets and drainage rocks in the bottom of the new pot. Mix potting soil for green plants with a little jardin soil, and fill a a third of the pot. Remove the ficus from its pot. If the pot is stuck, you can cut it with shears or pruners. Clean off the roots, place the root ball on the potting soil mixture and cover with more potting soil. Tamp the soil firmly, and finish by watering! The next water can be down in one week. Let your ficus dry a little so it can lay down it's roots. 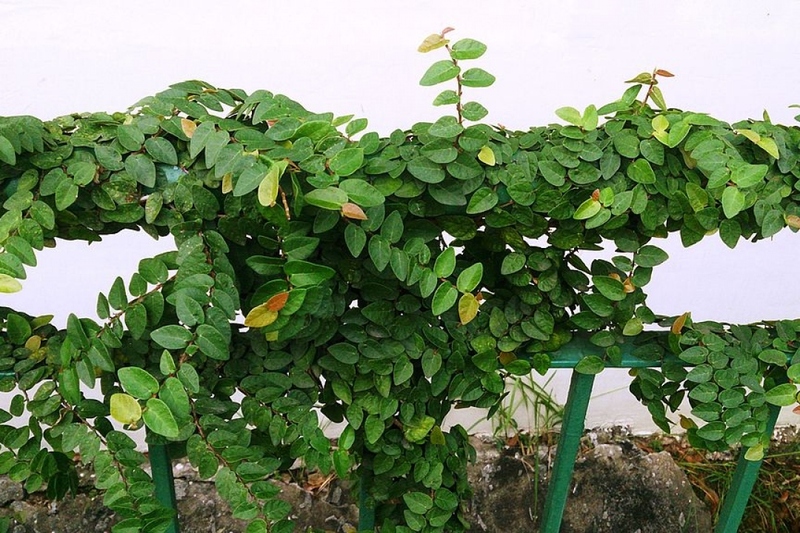 There isn't really a specific season to take a cutting from your creeping fig! Using sharp pruners, cut a section of healthy branch at a 45 degree angle, then remove the oldest leaves and keep only the four or five newest leaves at the tip. Finally, soak the cutting in a glass of water and leave it in a warm room. Change the water regularly. It will only take a few weeks before you see roots appearing at the cut end of the stem. When you're confident that there are enough healthy new roots, you may plant the cutting in a light substrate. Ficus is very sensitive to scale insects, small brown bugs often found in large numbers on leaves. You may also see a white felt forming on the back of the leaves. To get rid of scale insects, simply clean them off the leaves by wiping a q-tip over top — the bugs will cling to the q-tip. If you can, place your ficus outside, in half-shade. Bring your ficus indoors in a room at a temperature of 18-22 ° C, not going down below 15 ° C for the whole winter. Place it near a window, in bright light, without direct sun, sheltered from cold drafts.